In Kerala, Quilon is nearly 60 kms. from Trivandrum and situated in the banks of Ashtamudi lake. The town has several old temples, churches, mosques and the surrounding areas have great scenic charm. A variety of flowers, shrubs and trees grow on its banks and are reflected in the deep blue waters. There is a boat club in the Ashtamudi lake. Prominent on its shores are the Thevally Palace and the Government House. Luxuriant groves of coconut palms greet one every where as the boat moves through lakes, lagoons and canals. 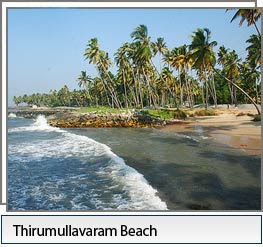 The Thirumullavaram beach near Quilon is a beauty spot and an ideal place for sea-bath and it is best place for morning walks. This is a very beautiful picnic spot and it is very well connected with bus facilities. Mannadi: This village is at Kerala. In Kerala's freedom struggle, this is a village of utomost importance, for Velu Thampi, the Dewan of erstwhile Travancore (1801-1809) attained martyrdom here is his fight against the British to free Travancore from British suzerainty. 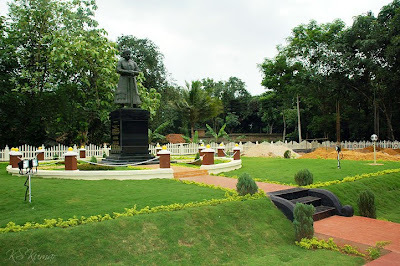 At the place of his martyrdom, there is a memorial called Velu Thamp Memorial Kalari. A sword is kept within it to remind the people of his great self-sacrifice. To the people of Mannadi, February 10 is a day of great importance - the day of martyrdom of that gallant hero of Kerala. This is one of the important tourist spot in Kerala. Ezhimala or Mount Eli: Ezhimala is about 25 kms. north of Cannanore town is a strange landscape in Kerala. It is as high mountainous area just on the brink of the sea. It was popular landmark of ancient foreign sailors. Plans are afoot to develop this unique place into a major a tourist center. During Sang period Ezhimala was H.Q. of Ezhimala Radi. In old literatures, Ezhimala is referred as Ezhil Malai i.e. beautiful hill. Later the name changed as Ezhimala. Ezhimala’s beautiful beach is the major tourist attraction. The ancient mosque, stone pillars and the rare medicinal herbs are seen near the Hills. You can see the beautiful scene of jumping Dolphins in the Ezhimala beaches is another tourist attraction. In Karnataka, Bijapur is well know for Chalukyan temples. It was also the capital city of Adil Shahis. Gol Gumbuz is a fine example of Islamic architecture. 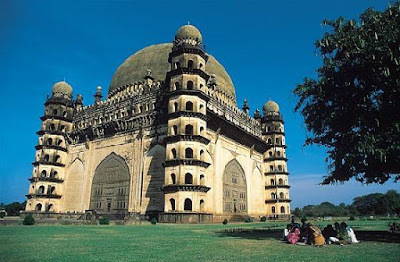 It dominates the entire Bijapur and is one of the largest structure of its kind in the World. It covers roughly 1,672.2 meters. It is a huge cube, with a vast hemispherical doom. There are octagonal towers of all the four corners. It is roughly 60 meters in height and 43 meters in diameter. There is a whispering gallery, which echoes a whisper twelve times over. This is fine example of engineering, architecture and acoustic. This is one of tourist attraction places in Karnataka. Coorg: The other name for Coorg is Kodagu. 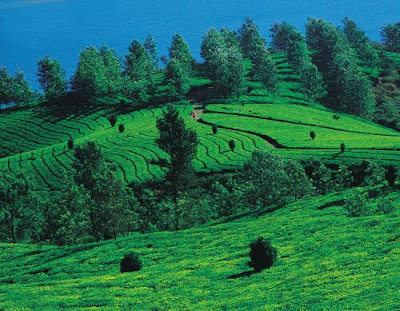 It is called as "Scotland of India" because of its beauty, calmness, mountains, lakes, coffee plantations along with orange, black pepper and smiling rice fields. The atmosphere is superb during April and it gives you a feeling that you are in a fairly land. 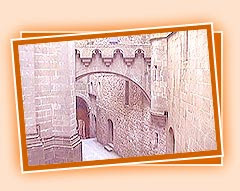 It has a attractive fort, now converted and houses a temple, a chapel, the prison and museum etc. A ridge known Raja's Seat, here Kodagu royal's used to come in the evenings to watch the beauty of Sunsets. The town has a Gold course. Around medikeri there are waterfalls an ideal picnic spot-Abbey Falls and Irupa Falls. Nagarhole National Park is very near from here. If you find time during April, have a visit to Coorg and enjoy the heavenly atmosphere. 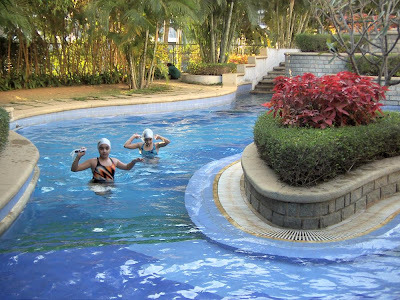 Bangalore is the capital of Karnataka and it has a superb pleasant climate all over the year. Bangalore is truly cosmopolitan city. Though Kannada is the official language, yet one feels perfectly comfortable speaking English, Hindi or any south Indian languages. Vidhan Soudha, Cubbon Park, Lal Bagh, Fort of Tippu Sultan, ri Guru Gangadhareshwara temple are some of important places in Bangalore for Tourists. 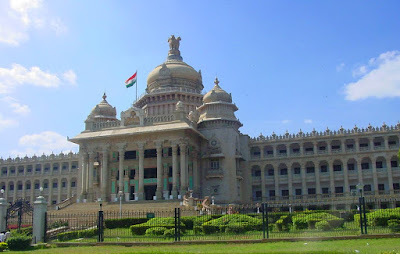 Vidhan Soudha: Built entirely from Bangalore granite a tribute to temple architecture, houses. Legislative Chambers of the State Government and offices of the administration are functioning here. Cubbon Park: Situated in the heart of Bangalore, this park is around 300 acres of land. In 1864, the former Commissioner of Mysore Mr.Cubbon laid the foundation stone for this beautiful park. Bal Bhavan: Walking distance from Cubbon Park,this is a paradise for children. It guarantees a lot of fun, joy in all sort of varieties and shapes and ocean of discovery. In Gulbarga splendid structures of Indo-Saracenic style are abundant. Here the Islamic architecture took its root in the 14th century and began spreading in South India. Jama Masjid of Gulbarga is modeled on the cathedral at Cardoba in Spain. Its roof encompasses as area of 40 x 50 metres covering the entire courtyard. Kalyani: It is the 10th century capital of Chalukyas and ancient capital of Jain Kings. It is said that at its peak it surpassed in beauty and splendor of all other cities in the World. Aruvikkara is about 16 kms. north of Trivandrum. Gifted with lavish scenic beauty, the place has an ancient temple dedicated to Goddess Durga, at the edge of a cool river. Devotees feed the sacred fishes in the stream, which are so tamed that they take food almost direct from their hands. Near the temple there is picturesque water fall. The river has been dammed u to form a reservoir. This Aruvikkara dam is a very beautiful place and ideal for picnics. This reservoir supplies water to Trivandrum city in every season. Pulayanarkotta: This beauty spot is 8 kms. north west of Trivandrum is near Veli Lake. A fine reserve forest and a TB Sanatorium are here. The place, it is believed was once the seat of a powerful Adivasi King. 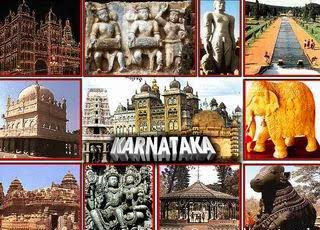 Karnataka is famous for art and architecture and the designs, decorations and tile work etc. are unique and fascinating at Bidar. Sharaza Darwaza is the second gateway to the Fort and there is a excellent tile work on the outer walls. Gumbad Darwaza is the door way and it is famous for its architecture. Rangin Mahal: To the left to the Gumbad Darwaza steps lead upto the Color Palace, Mohammad Shah took refuge in the Shah Burz adjoining the Gumbad. The King felt that it was auspicious to live there so the rooms were built into the Rangin Mahal. Mother of peal has been used lavishly for making floral designs with granite carvings. A holiday resort, Neyyar Dam site is 32 kms. away from Trivandrum. The reservoir is about 9 sq. ms. and offers excellent facilities for boating. There is a miniature wild life sanctuary also. The hills and rocks are ideal spots for training in mountaineering. This is superb Tourist place in Kerala near Trivandum. Aruvippuram: A picturesque place ear Neyyattinkara, it is a calm, serene hill resort. There is a temple founded by Sri Narayana Guru and a cave where the Guru meditated for long periods. People came to this temple and pray their and spend their weekends here.